Despite the rise of ‘new’ security threats like terrorism, cyber-war and piracy, the terrible destructive power of nuclear weapons still hangs over the world. Discussion on further strategic nuclear arms reduction has tended to be dominated by the analysis of possible trade-offs between the US and Russia. But as the prospect of further cuts below ‘New START’ levels is contemplated, increasing attention needs to be paid to the possible shape of a new, multi-power approach to nuclear restraint. While restraint at low numbers goes with the grain of thinking in most nuclear states, correct sequencing will be vital. Using the New START framework, attention could initially be focused on incremental decreases in US and Russian stocks of the most dangerous weapons. Thereafter, the other nuclear powers would need to take steps to limit the size and capabilities of their own arsenals in a process of mutual reductions. If successful, the benefits would be wide ranging: successful restraint amongst existing nuclear-armed states could engender trust, as well as provide mechanisms for reducing the risks of rapid escalation in the event of limited conflict. 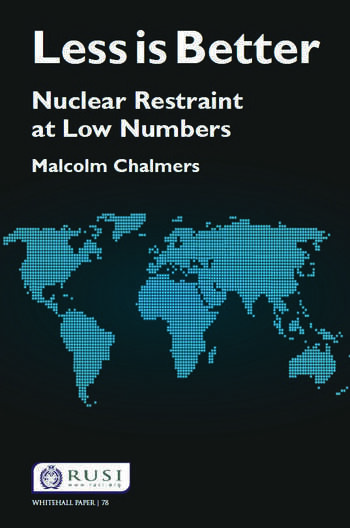 Less is Better considers the various challenges and opportunities for ensuring restraint at low numbers in today’s complicated web of bilateral nuclear relationships and in the context of the debate on ‘Global Zero’. Professor Malcolm Chalmers is Research Director and Director (UK Defence Policy) at RUSI. He is a Special Adviser to the UK Parliament's Joint Committee on the National Security Strategy, and was a member of the UK Cabinet Office consultative group for the 2010 Strategic Defence and Security Review, and of the UK Defence Secretary's Advisory Forum for the 2010 Defence Green Paper. He was Visiting Professor of Defence and Foreign Policy in the Department of War Studies, Kings College, London, and was an FCO Special Adviser to Foreign Secretaries Jack Straw MP and Margaret Beckett MP.